The last time that Jill Stein ’72-’73 ran for President of the United States, she was arrested at a national debate. While fellow Harvard graduates Mitt Romney and Barack Obama took to the stage, Green Party candidate Stein was barred from the forum. When she showed up anyway, she was removed from the site and handcuffed to a chair at a nearby police facility for hours, well after the crowds and press had left. Presumptive Green Party presidential candidate Jill Stein ’73 speaks at Northeastern’s Million Student March in October. Now in the thrust of her second campaign for Commander-in-Chief, Stein faces an uphill battle against the two mainstream parties. But with the same activist mindset that she was introduced to as an undergraduate at Harvard, along with a steadfast belief in her political principles, and an absolute willingness to be arrested again, she has far from given up hope in her ability to make a difference. While she is known today for marching outside of coal plants and protesting in foreclosed homes, many of Stein’s first encounters with activism took place in Harvard Yard. As an undergraduate during the Vietnam War and Harvard College’s first move toward co-ed housing, Stein’s college career was marked by significant social movements that swept over the student body. During Stein’s freshman year, she witnessed the historic 1969 Harvard student strike, when students stormed and occupied Massachusetts Hall to protest the University’s relationship with the military until police officers forcibly removed them. After graduating with her second Harvard degree from the Medical School in 1979, she began noticing many of her patients’ ailments seemed rooted in environmental pollution. Stein moved from participating in activist movements to organizing them after she developed a passion for environmental health activism while working at a health clinic, finding a niche she never discovered at Harvard. 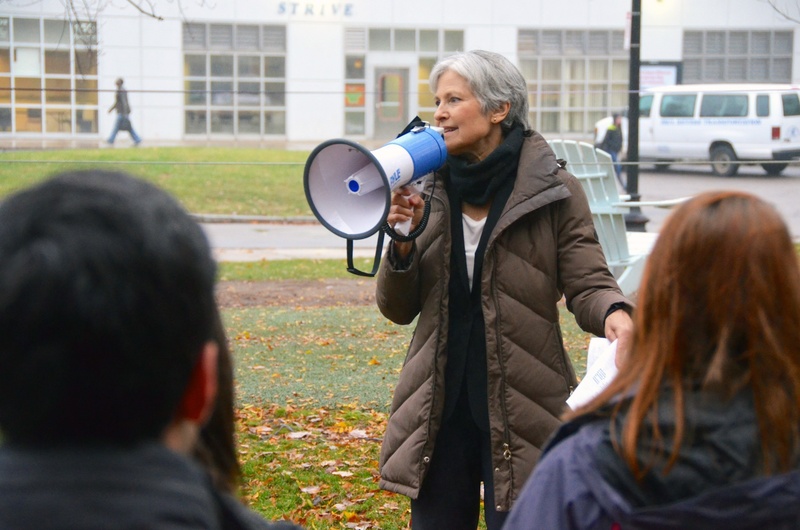 Gaining prominence in that field, Stein’s first introduction to organized politics came when the Green Party recruited her to run for Governor of Massachusetts in the 2002 election. “[The Green Party] said ‘just do what you’re doing. Continue fighting power plants and incinerators. Continue advocating for healthy jobs that are good for workers, the community and the planet in the form of recycling and green energy. Do that, but call it a political campaign,’” Stein said. As her political career developed, Stein’s stance on issues has come to be synonymous with the Green Party as a whole—left-wing with an environmental focus. The center of her Presidential platform is a Green New Deal, her plan to revitalize the economy and environment by providing jobs in the sustainable energy sector. With the goal of reaching full employment by providing a job to every American who wants one, Stein hopes to replicate key aspects of the New Deal legislation of U.S. (and also Harvard Crimson) President Franklin D. Roosevelt, class of 1903. Stein expects that if implemented, the Green New Deal would allow the US to become fully dependent on renewable energy within 15 years. She also takes a liberal stance on domestic policy, saying her positions are mostly identical to those of Democratic candidate Bernie Sanders. Stein takes Sanders's platform one step further, she said, when it comes to education, not only planning on making all public colleges free but erasing all existing student debt. 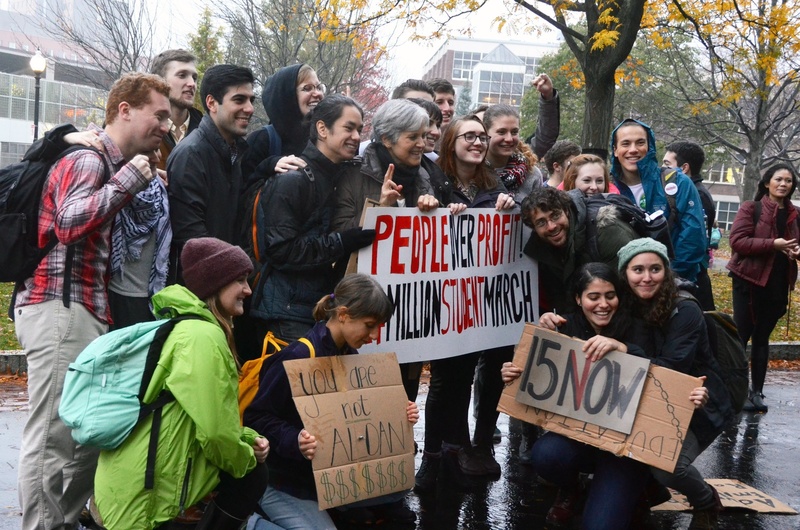 Presumptive Green Party presidential candidate Jill Stein ’73 poses for a photo with students at Northeastern’s Million Student March in October. Stein championed the cause at a Million Student March rally at Northeastern University in November, where recent Massachusetts Institute of Technology graduate Eduardo I. Vargas said he would “absolutely” vote for Stein in the general election. “I understand that she stands for the right things,” he said. 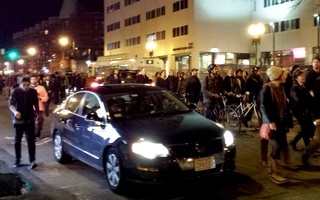 No Green Party supporters at Harvard could be reached for comment for this article. Although also an outspoken supporter of civil rights and major criminal justice reforms, perhaps Stein’s biggest policy difference with Sanders is her stance on the Democratic party. The Green Party does not accept any corporate contributions, raising most of its money online from grassroots supporters. But with coffers dwarfed by those of her fellow candidates, that donation policy takes its toll. Stein is the most successful female candidate ever to run in a Presidential general election, yet with only 0.36 percent of the vote in 2012 her chances of governing from the Oval Office have been, and continue to be, bleak. As the presumptive candidate from the Green Party, Stein’s presidential campaign faces many obstacles before she can gain the prominence enjoyed by her Democratic and Republican challengers. “Most people don’t know that small parties exist because they are purposefully suppressed by the Democratic and Republican parties because they actually do represent the ideals and the values of the broader American public,” Stein said. Although Government professor Ryan D. Enos agreed that third parties are disadvantaged by the structure of the electoral system, he seriously doubted that the mainstream parties actively colluded against the Greens. Green Party candidates are often barred from debates, struggle to raise funds, and sometimes left off state ballots, forcing them to gather signatures in some states just to get candidates' names on the ballot. But even among those voters who agree with her stance, Stein faces significant roadblocks. Government lecturer Colin M. Brown said that if voters want to elect someone who shares their ideals, a vote for the Green party is “basically going to be wasted” until it becomes more powerful. Other liberal voters remain hesitant to vote for third party candidates because of the “spoiler effect,” worried that by not voting for a Democratic candidate, a Republican would more likely win. Despite having lost two gubernatorial races, a state house election, and a previous Presidential run, Stein still has hope for success, believing that now is her time. Stein hopes that the excitement around Bernie Sander’s progressive campaign will benefit her in the general election, hoping that if he loses the Democratic primary, his supporters will flock to her. “We will be the Plan B for Bernie,” she said. Still, Government professors say she has no serious chance of winning.